This is a partial list of works with links to stories that can be read online or found in print magazines. Stories sometimes disappear and when I find out I usually do my best to remove the link. My fairy story "The Giant's Last Feast" appeared in Issue 6 of New Fairy Tales magazine. The story was inspired by the fairy stories of George MacDonald (as are several of my stories), and, inevitably, Oscar Wilde's The Selfish Giant (though I didn't realise it when I was writing the story). It is illustrated by the talented Laura-Kate Chapman (see picture to the left). To read the magazine, visit The Fairy Tale Cupboard here. This story was published in The Criterion and can be found here (scroll down to read the story). The title references Yeats' 'The Man Who Dreamed of Fairyland' and there are some similarities of theme between my story and 'The Stolen Child'. This is a story rooted in my childhood, and it appears on the Fickle Muses website. It deals with how our attachments to things and people constantly shift and dissolve, and the strange way this is linked with loss. The story can be read here. I'm a bit late putting this up, but my story "Ratcatcher" is featured in Larks Monthly Review in the edition dated March 2012. 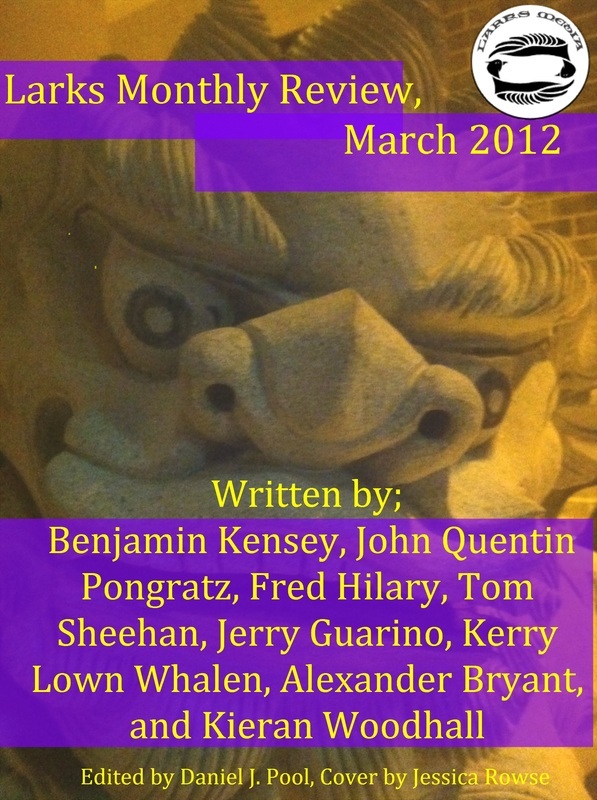 The anthology is available in digital form from Smashwords here. Ratcatcher, a story with a modern setting, based in part on memories of my schooldays, is up over at Larks Fiction Magazine. It is part of the issue dated March 18th and can be read online here. Scroll down the page to read the story. "Mistress of Storms" is a story about a weather witch. It appears in the print anthology "Halloween Frights Volume III" (published by Wicked East Press) and can be ordered from amazon.com here. I haven't seen the anthology yet but my own tale is very much in the old tradition of M.R. James, Algernon Blackwood and Conan Doyle. My story "Squatters' Rites" appears in the RuneWright anthology "Spirit Legends: Of Ghosts and Gods". It features a witch (yes, another one) and a faun, and is set in modern-day Greece. You can buy the book in good old-fashioned print form if you wish, or if electronic books are your thing there are also ipad and kindle versions. Order details can be found here. The story appears in the book as Squatter's Rites but there is more than one 'squatter' in the book and the title above is the correct one. Issue 33 of The Mythic Circle, published by The Mythopoeic Society, featured my story "The Fairy Wife", which takes some of its inspiration from A Midsummer Night's Dream. As an Inklings fan, I am particularly proud to contribute. The marvellous illustrations of Oberon and Titania (seen hunting on the cover) are by Bonnie Callahan. The journal is available to order ﻿here﻿. This is a story completed way back in 2010, and written very much under the influence of fairy tale master George MacDonald. It appears in the anthology Make a Wish, produced by Static Movement, and true to the precepts of the anthology is about a wish that goes tragically wrong. The anthology can be purchased from amazon co uk here and from amazon com here. A story about an extraordinary pupil and the perils of jealousy, Alexander the Great appeared at Piker Press. The story can be read here. Wildberries Journal Issue 2 contains my story "The Myth of Man". It was inspired by Mr Tumnus's bookshelf. You can read the magazine here. For a silly but fun story about dinosaurs, which were one of my childhood obsessions, you might want to look at The Cynic magazine. "Grow Your Own Dinosaur" can be found here. "Patronage" is an older story of mine that deals with the sometimes mystical nature of poetic inspiration. You can read the story by clicking on the link on the top of this page.